• Provide relevant data and tools for GSAs to incorporate climate change into their GSPs. • Provide an analysis approach using the provided data and tools that incorporates the best available science and best available information to date. 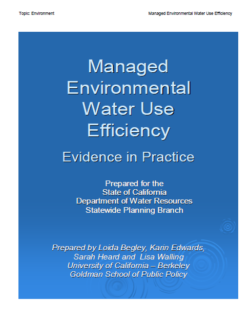 The California Water Plan Update 2005 first introduced the term Managed Environmental Water Use Efficiency (MEWUE). 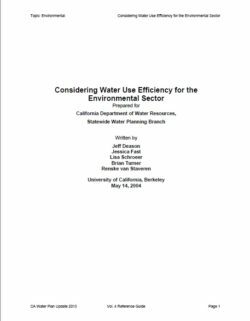 Specifically, it defines MEWUE as a “mechanism to analyze alternative uses of managed environmental water to determine which allocation of a given amount of water will maximize environmental benefits, and as a means to improve decision-making over time.” While MEWUE is a new term, we found several instances where managers maximized environmental benefit from a given amount of water in current practice. Formalize a MEWUE Policy to clearly state that the goal of MEWUE is a management strategy to maximize environmental benefit and not a water conservation policy. Develop Best Management Practices to increase understanding, provide guidance, and encourage use of MEWUE. Operate a MEWUE Pilot to learn more about the way MEWUE works, understand its strengths, and improve on its weaknesses. Facilitate an Environmental Water Market by applying experience and infrastructure to provide solutions for projects that require more water. The objective of this Best Management Practice (BMP) is to assist in the development of Monitoring Protocols. 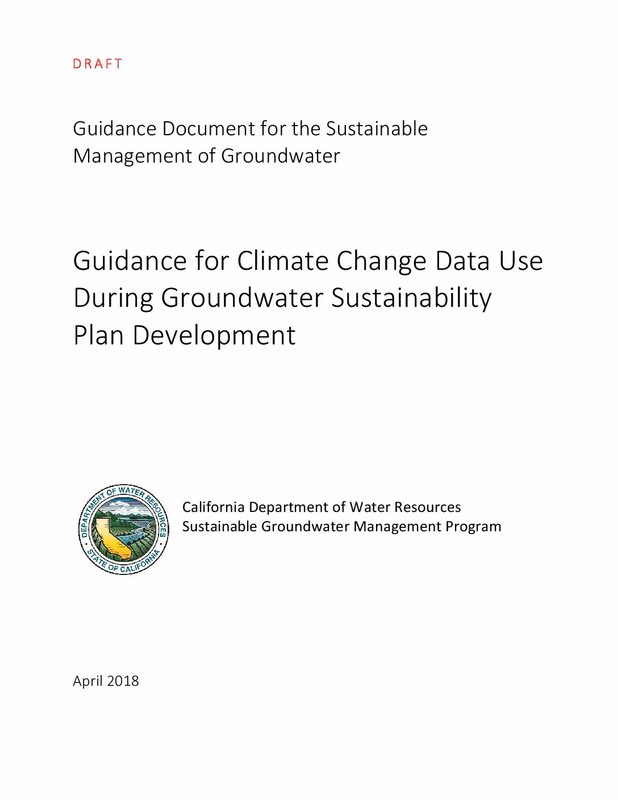 The California Department of Water Resources (the Department or DWR) has developed this document as part of the obligation in the Technical Assistance chapter (Chapter 7) of the Sustainable Groundwater Management Act (SGMA) to support the long-term sustainability of California’s groundwater basins. 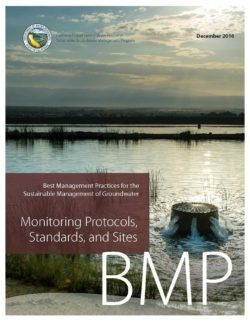 Information provided in this BMP provides technical assistance to Groundwater Sustainability Agencies (GSAs) and other stakeholders to aid in the establishment of consistent data collection processes and procedures. In addition, this BMP can be used by GSAs to adopt a set of sampling and measuring procedures that will yield similar data regardless of the monitoring personnel. Finally, this BMP identifies available resources to support the development of monitoring protocols. Objective. A brief description of how and where monitoring protocols are required under SGMA and the overall objective of this BMP. Use and Limitations. A brief description of the use and limitations of this BMP. Monitoring Protocol Fundamentals. A description of the general approach and background of groundwater monitoring protocols. Relationship of Monitoring Protocols to other BMPs. A description of how this BMP is connected with other BMPS. Technical Assistance. Technical content providing guidance for regulatory sections. Key Definitions. Descriptions of definitions identified in the GSP Regulations or SGMA. Related Materials. References and other materials that provide supporting information related to the development of Groundwater Monitoring Protocols. The objective of this Best Management Practice (BMP) is to assist in the use and development of hydrogeologic conceptual models (HCM). The California Department of Water Resources (the Department or DWR) has developed this document as part of the obligation in the Technical Assistance Chapter (Chapter 7) of the Sustainable Groundwater Management Act (SGMA) to support the long-term sustainability of California’s groundwater basins. Information provided in this BMP is meant to provide support to Groundwater Sustainability Agencies (GSAs) when developing a HCM in accordance with the Groundwater Sustainability Plan (GSP) Emergency Regulations (GSP Regulations). This BMP identifies available resources to support development of HCMs. Objective. The objective and brief description of the contents of this BMP. HCM Fundamentals. A description of HCM fundamental concepts. Relationship of HCM to other BMPs. A description of how the HCM relates to other BMPs and is the basis for development of other GSP requirements. Technical Assistance. A description of technical assistance to support the development of a HCM and potential sources of information and relevant datasets that can be used to further define each component. Key Definitions. Definitions relevant for this BMP as provided in the GSP and Basin Boundary Regulations and in SGMA. Related Materials. References and other materials that provide supporting information related to the development of HCMs. 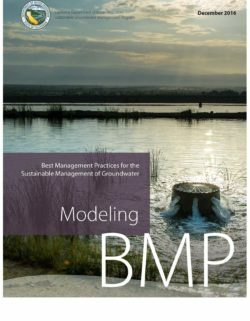 The objective of this Best Management Practice (BMP) is to assist with the use and development of groundwater and surface water models. The California Department of Water Resources (the Department or DWR) has developed this document as part of the obligation in the Technical Assistance chapter (Chapter 7) of the Sustainable Groundwater Management Act (SGMA) to support the long-term sustainability of California’s groundwater basins. 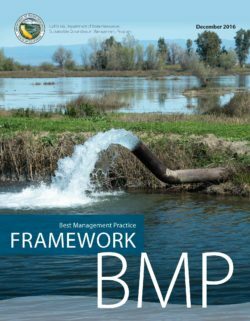 Information in this BMP provides technical assistance to Groundwater Sustainability Agencies (GSAs) and other stakeholders on how to address modeling requirements outlined in the Groundwater Sustainability Plan (GSP) Emergency Regulations (GSP Regulations). This BMP identifies available resources to support the development of groundwater and surface water models. 1. Objective. The objective and outline of the contents of this BMP. 2. Use and Limitations. A description of the use and limitation of this BMP. 3. Modeling Fundamentals. A description of fundamental modeling concepts. 4. Relationship of modeling to other BMPs. A description of how modeling relates to other BMPs and is a tool used to develop other GSP requirements. 5. Technical Assistance. A description of technical assistance for the development of a model, potential sources of information, and relevant datasets that can be used to further define model components. 6. Key Definitions. Definitions relevant for this BMP as provided in the GSP Regulations, Basin Boundary Regulations, and SGMA. 7. Related Materials. References and other materials related to the development of models. 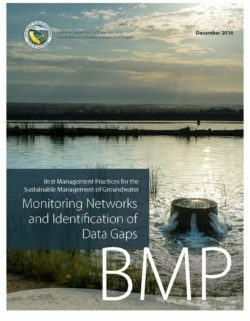 The objective of this Best Management Practice (BMP) is to assist in the development of Monitoring Networks and Identification of Data Gaps. The California Department of Water Resources (the Department or DWR) has developed this document as part of the obligation in the Technical Assistance chapter (Chapter 7) of the Sustainable Groundwater Management Act (SGMA) to support the long-term sustainability of California’s groundwater basins. 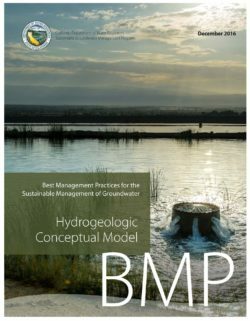 Information provided in this BMP provides technical assistance to Groundwater Sustainability Agencies (GSAs) and other stakeholders to aid in the development of a monitoring network that is capable of providing sustainability indicator data of sufficient accuracy and quantity to demonstrate that the basin is being sustainably managed. In addition, this BMP is intended to provide information on how to identify and plan to resolve data gaps to reduce uncertainty that may be necessary to improve the ability of the GSP to achieve the sustainability goal for the basin. 1. Objective. A brief description of how and where monitoring networks are required under Sustainable Groundwater Management Act (SGMA) and the overall objective of this BMP. 3. Monitoring Network Fundamentals. A description of the general approach and background of groundwater monitoring networks. 4. Relationship of Monitoring Network to other BMPs. A description of how this BMP is connected with other BMPs. 5. Technical Assistance. Technical content of BMP providing guidance for regulatory sections. 6. Key Definitions. Descriptions of those definitions identified in the GSP Regulations, SGMA, or Basin Boundary Regulations. 7. Related Materials. References and other materials that provide supporting information related to the development of Groundwater Monitoring Networks. Prior to the completion of a best management practices (BMPs) document, the Department of Water Resources (DWR) was required to adopt regulations for evaluating groundwater sustainability plans (GSPs), the implementation of GSPs, and coordination agreements by June 1, 2016 (GSP Regulations), and Alternatives.